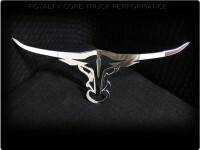 13856: Long Horn Grille Logo. This very high quality precision made universal grille logo will fit any custom mesh or billet style grille. Made from thick 12 gauge top quality T-304 stainless steel, it comes highly polished to a chrome shine. Measures 7.5" tall by 19" wide. Installs with threaded studs and nuts welded on backside. Made in USA. (Please allow about 2 weeks in manufacturing before shipping). Tell your friends about the Universal Grille Logo - Long Horn. Share this product on Facebook, Twitter, MySpace or send an email to a friend!